Whether you live in rural Texas or in one of the state’s sprawling suburbs or bustling cities, you can count yourself as a county resident. Texas’ strength lies in this grassroots level of government. Your county is served by locally elected and appointed officials, who work to provide you and your neighbors with myriad essential services, often delivered in response to the unique needs of your community. This important combination of place and self-governing — neighbors serving neighbors — is at the heart of the history and development of Texas. The first Texians brought with them the rock-ribbed values of independence, self-reliance and freedom to determine their own destiny. Those values persist in our civic DNA. It’s a lineage that can be traced from the Spanish municipios that became our first counties when Texas became a nation, into statehood with the 254 counties strong we are today. As our population grew, legislators charged counties to act as the functional arm of the state government and deliver many state services to Texans. At the heart of that charge is trust. It’s a trust that the far-flung communities of this great state can organize and elect from among their own the local leaders they want to manage their affairs, to carry out their will and the state’s will in a manner that is efficient, effective and best fits their needs. 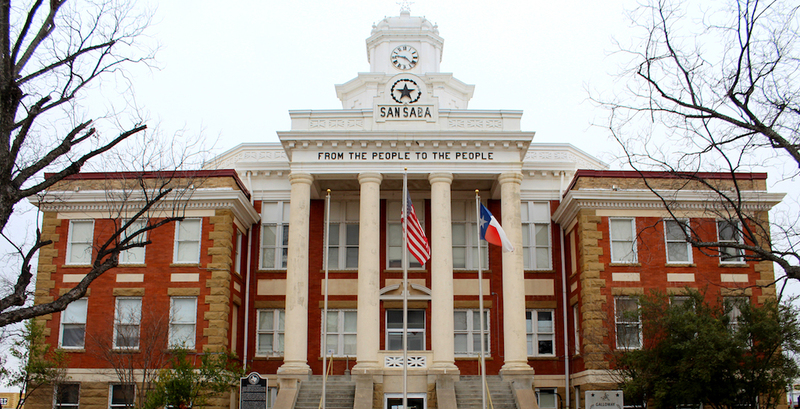 San Saba’s courthouse square and those in hundreds of other county seats across the state are at the heart of their communities. It’s in those courthouses and other county buildings where so many of the essential functions of governing in Texas are carried out. Walk into a county courthouse or other county facility and you can register your truck, obtain a marriage license or watch district court trial proceedings. You may also find a fellow Texan visiting a probation officer, getting connected with veterans’ services or registering to vote. Maintaining Texans’ most important records, from birth certificates, marriage licenses, adoption and name-change records to bonds, divorce records, wills and death certificates. Maintaining all court records and records of property ownership, from land deeds and minerals rights to livestock brands. Keeping Texans and the economy moving by building and maintaining nearly half of the state’s roads and one in five of its bridges. Coordinating emergency management during natural and man-made disasters. When local residents and their county governments are trusted by the state to act in the best interests of their communities, government remains efficient and effective. County officials govern among the people, they respond to local needs and get things done. Speaking as a former county official, I can tell you we see what’s working in our communities and what needs to be improved. We know what doesn’t work, and we know what we’re missing. We hear from our citizens daily, in person, and we know what they want. From Anderson to Zavala, and every county in between, each of the state’s 254 counties delivers effective, efficient, local solutions to you and your fellow Texans. Please visit www.TexasCountiesDeliver.org to learn more about how Texas counties serve you.